Fun…what types of boats and how many boats are in the fleet? Our boat fleet is designed to meet our Member’s boating needs and includes 20’ to 27’ boats with lots of seating plus ample horsepower for towing water toys. With a history of over 20,000 outings, we have built our fleet to include a combination of ski boats, pontoon boats, fishing boats, and sailboats. Our current fleet is large enough and has enough variety of boats to fully support our membership goals for this year. Easy…what all is included with the membership? All Members get UNLIMITED USE of our fleet of new recreational boats PLUS complimentary water toys and fishing gear. 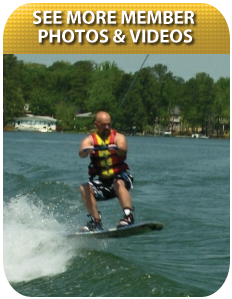 New members receive complimentary on-water boating instruction. All Members have Full Coverage Insurance – including their family and their guests. Plus, all members have reciprocal guest privileges at other Nautical Boat Clubs nationwide. We have a variety of Membership levels to accommodate different boating needs, but ALL Members pay a One Time Membership Fee and Monthly Dues for 12 months. Members have the option to renew in 12 month increments without repaying the initial Membership Fee. The only other cost is replacing the fuel that you use during your outing. There are no hidden fees! For more details see our costs. How do I know I am going to get a boat? 22 Years of Success! As part of Nautical Boat Clubs™, we are a proven concept. Over a 22 year period, Nautical Boat Clubs™ have filled over 97% of their reservation requests. Lake Murray Boat Club has filled over 99% of its reservation requests, which represents over 26,000 outings, during its first 14 years in business. Tour the Boat Club and see our boat use statistics, and then put us to the test by asking for a reservation. Do you limit the number of memberships? Boat availability is critical to keeping happy members so we monitor several ratios including the number of boats and number of members. Each year, we have a limited number of memberships available. Once the club reaches capacity, those interested in membership will be placed on a waiting list until the next spot becomes available. How can I see for myself? Our top priority at the Lake Murray Boat Club is outstanding customer service for our members. Therefore, we conduct club tours by APPOINTMENT ONLY. Appointments can be made by calling 803-407-2828 or contacting us via email (Contact Us). During your tour of the Club, you will review the fleet, select a membership plan that best fits your boating needs, and learn all about our Valet Boating service. We will answer all your questions honestly and give you all of the information that you need to make the best decision for your boating needs. If you decide that our “hassle-free” boating is a fit for your boating lifestyle, we have a limited number of memberships available each year and you will have the opportunity to join or be placed on a new member waiting list. If we don’t see a match, we will gladly refer you to local boat dealers or boat rental services. "I must say it is a joy to deal with you and your folks. Stacy and I do not have a strong nautical background, and you and your team always go out of your way to make our experience very enjoyable. From having all the equipment ready, to giving friendly advice on the proper way to drive the boat and dock (especially dock), we could not ask for a better group of people. We are looking forward to many more happy days on the water." "I am so glad I no longer own a boat and have such a wonderful staff assisting me with a all my needs I feel like I now own a fleet of boats and have a staff maintaining them just for me. They are awesome let Shayne guide you to a better way of boating."